Op-Ed article by David B. Layzell and Manfred Klein. Published in The Globe and Mail on August 22nd, 2015. Figure 1. The inner workings of the generation section for one of two 85 MWe Cogeneration units associated with MEG Energy’s SAGD facility at Christina Lake (2014 production: 71,186 bbl/day). These units provided the power and about 50% of the steam needed for the Christina Lake facility while exporting electricity to the grid. If the other Alberta SAGD operations were to follow this example, SAGD power could make it possible to retire the province’s coal plants before their 50 year ‘best-before’ date and reduce GHG emissions by up to 227 Mt CO2e by 2030. Image provided by MEG Energy. To generate electricity, Alberta relies on burning coal and natural gas, producing more than 46 million tonnes of carbon dioxide a year; that’s more than 11 tonnes per capita. However, most of this thermal power generation uses technologies that capture only 30 per cent to 50 per cent of the fossil fuel energy in the electricity product. The rest of the energy is lost as heat, being dumped to either the atmosphere or water. In Alberta, this discarded heat adds up to 393 petajoules (PJ) a year, more than the energy used each year by all residential, commercial and institutional buildings in the province. In most jurisdictions in the world that rely on thermal power generation, there are no industries that could possibly use the discarded heat energy from power generation, so this loss is typically considered part of the price for a reliable electricity supply. Alberta is different, and it is because of the oil sands. Steam assisted gravity drainage (SAGD) is an oil sands technology that produces about one million barrels of bitumen a day. It requires 408 PJ of heat energy a year to make the steam, and that process alone generates about 24 million tonnes of carbon dioxide a year, or six tonnes for each Albertan. So, in Alberta, we have one industry sector burning fossil fuels for power generation and throwing away about 393 PJ of heat energy a year, and at the same time another industry sector is burning more fossil fuels to generate an additional 408 PJ of heat energy a year. In a world concerned about energy efficiency and climate change, this makes little sense. We need to integrate the SAGD and thermal electricity sectors in the province for the benefit of the environment and the economy, and the time to do it is now. The Alberta government has set a “best before” date on the province’s carbon-intense, coal-fired generators and 14 per cent of their current capacity must be retired by 2019; 60 per cent by 2030. There will never be a better time for transforming the power generation infrastructure in the province. The current plan is to replace the coal infrastructure with natural gas combined cycle plants. Certainly, they produce lower-carbon power than coal, but 50 per cent of the fuel energy will still be discarded as waste heat, and there will be no “greening” of Alberta’s oil sands. Figure 2. The stack on the cogeneration unit at MEG Energy’s Christina Lake SAGD facility. Image provided by MEG Energy. Large-scale SAGD-integrated cogeneration is a better alternative. Natural gas is burned in gas turbines that convert about 36 per cent of the energy in the fuel to electrical power. Much of the residual heat can be captured to make steam for SAGD, resulting in the use of 80 per cent or more of the fuel energy. That means lower fuel use – a major input cost for both SAGD and power generation – and lower overall greenhouse gas emissions. Cogeneration is widely used in oil sands operations today, but primarily to meet the industry’s own power needs. 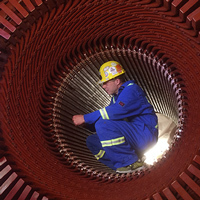 By “supersizing” cogeneration in the oil sands, SAGD facilities can not only meet their own needs for both heat and power, but also provide reliable, baseload, low-carbon power to the Alberta grid. In fact, SAGD’s appetite for steam could even become the major driver for the early retirement of Alberta’s coal-fired power, removing an additional 227 million tonnes of carbon dioxide and about one million tonnes of air pollution between now and 2030. Improved air quality and health benefits, the ability to modulate cogeneration to better integrate renewables into the grid, and the potential for lower costs for both bitumen and power production are but bonuses to this “made-in-Alberta” climate change solution.